It is 1847: the celebrated Civil War General William Tecumseh Sherman is a mere lieutenant, serving as adjutant to the military governor of newly-conquered California, foremost prize of the recent Mexican War. For the next three years Sherman will enjoy in an intimate friendship with the de la Guerra family of Santa Barbara and Monterey, especially with Angustias de la Guerra, La Doña of Monterey. This friendship, however, is severely tested during and after that brief war, since the de la Guerra family, like many Californios, intensely desire to keep California an independent country, free of both Mexican and United States control; yet the family also values their friendships with sympathetic Americans like Sherman and US Consul Thomas Larkin. So even while Doña Angustias and her brothers actively resist the American takeover, La Doña is still the charming ambassadress par excellence of her culture to the conquering Americans; she is as well the enchanting and intimate friend of Lieutenant William T. Sherman, who escorts her to dances and is dazzled by her at fiestas at the family hacienda, where Sherman lives for many months. Paramount, however, for Lieutenant Sherman through all these trials and amusements is that he must employ extreme strategies in order to resist his enchantment by La Doña Angustias, the magnificently competent and beautiful Doña of Monterey, whose de la Guerra family owns a half million of the finest acres in all California, and whose husband is dying. Sonny Wells is a New York lawyer who's come west to help create government in the wilds of California, legal clerk for the military governor, General Mason. Even so, Sonny loves the excitement he finds in gold rush San Francisco, and he leaves Monterey to become a partner with the flamboyant Robert Parker, owner of the notorious Parker House. Before he makes that fatal step, however, he meets Valerian, the abandoned recluse of Mission Dolores. There he gives her a book of poems by Edgar Allan Poe, and this poetry will enchant Valerian, and Poe’s living voice becomes foremost of the invisible visitors that both comfort and haunt her in her deep, dark solitude. Poe speaks to her, and she answers, and eventually wishes to be with him. He draws her to him: though he is in Baltimore: though she has not dared go outside the mission’s walls in four years. Nor has she even seen the wonder of San Francisco two miles away across the sand dunes, which is arising so suddenly, so miraculously on the beach of the cove. Yet the mission is dying and she must leave it. Panama City, 1850, is still at the heart of the tropical jungle, where savages drums can be heard in the night and cheetahs scream in the tree tops. It is also the quickest route east or west, to or from the fabulous gold fields of California. The American Hotel is usually only a brief stopover for these travelers, but on this day the layover will be extended, since the savages in the jungle seem prepared for trouble. 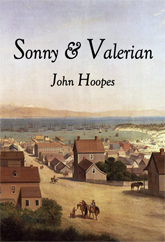 Even Sonny with his chest of gold, and Valerian, going to meet Edgar Allan Poe in Baltimore will be delayed; and in that twenty-four hours their lives, as well as the lives of several others secluded there, will become transformed by the rapid and explosive chain of events. Come inside, human--fear not. Come inside and enter the undersea life of dolphins and whales. 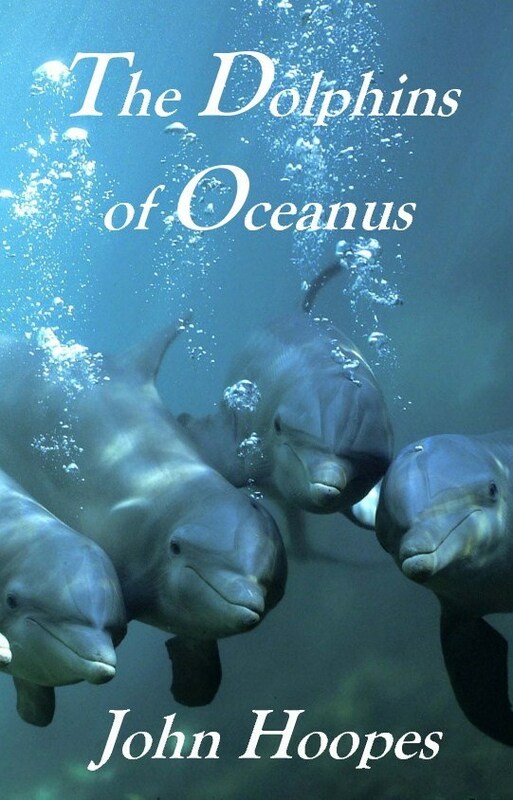 Swim away with these highly developed, sophisticated beings, who have been evolving twenty million years here in Oceanus, waiting for us, their co-stewards of the planet, The Child, to be born. Much awaits The Child, as much awaits you, in this ancient but unfathomed oceanic kingdom. A radiant jewel of great power has mysteriously crossed the galaxy and fallen into Oceanus, to be swallowed by a drowning boy, who is instantly transformed to a dolphin. This jewel of transformation inside the body of the boy-dolphin continues to radiate its power, and by dolphin sonar it is known to the Guardians of the dolphin colony. However, they must teach the miraculous transformation how to survive the ocean so they may study the mystery of what he is and how he came to be there and why. This immense, radiating power within the boy-dolphin will also attract three eccentric dolphins, who, contrary to the altruistic efforts of the colony, seek to control the jewel’s power for personal reasons: Lirias the half-blind cynic, because it heals his blindness, even as he discovers its darker, addictive aspects; Nania, his daughter, who strives to be loyal to the colony, despite her desire to master the visionary world, as she helps nurture the confused transformation in his struggles both with his new body and with the augmenting power of the jewel; and Talella, Nania's visionary teacher, who opposes them all, determined to make the jewel’s power her own. It is 1937, the Golden Age of Jazz and of Radio. The Hit Parade plays all the great new songs. Life is hopeful again and the innocents come forth. Bobbie is eighteen in Birmingham, Alabama. She sings in a band and for radio. In a crisis Bobbie signs on with Jay Gould’s traveling magazine sales crew, heading to Los Angeles. Ralph is in Rexburg, Idaho, the same year, disliking the family farm and hating the winters there. 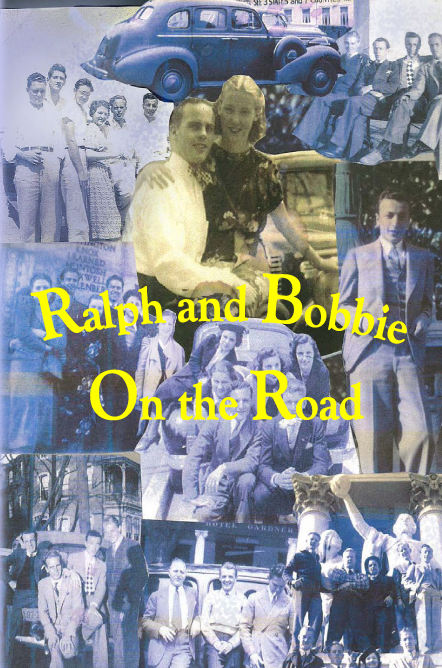 Defying his father, Ralph leaves home to go on the road with Martin Seward’s magazine crew, traveling the US with new buddy Vic Sabattini, a kindred wandering spirit. Ralph and Bobbie are both fearless and primed for destined events. Eventually it must be that their paths lead to each other and their destinies merge. 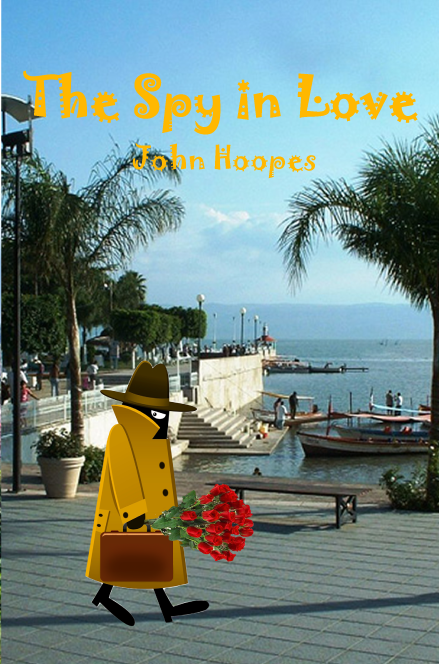 A perfect climate and the serenity of quaint fishing villages attract swarms of retiring Americans and Canadians to Lake Chapala in Mexico. This real estate bonanza begets a comedy of suspicion, deceit and intrigue among the many aspirants to the prize. 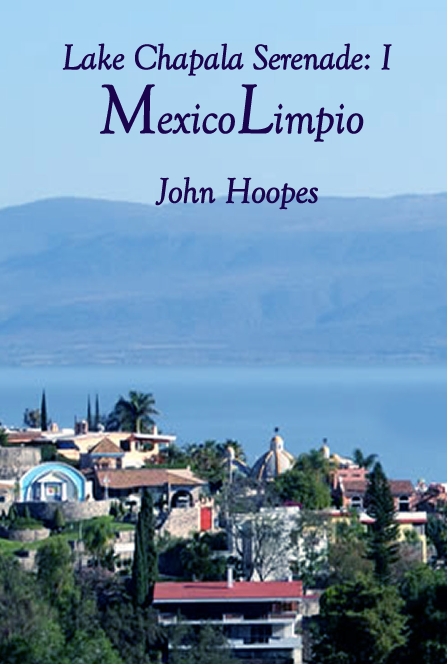 Yet even such a perfect model, walled-in community as MexicoLimpio must employ the services of spies and counter-spies to thwart not only its competitors, but also enemies within and enemies imagined. 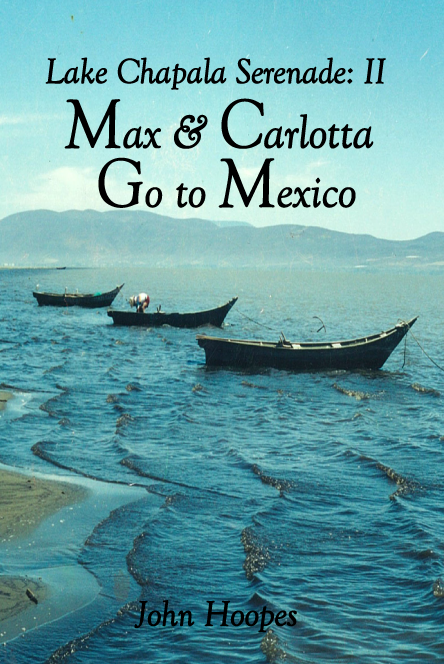 The inevitable turn of the century California Malaise has finally settled on old hippies Max and Carlotta and they flee to Mexico. They build one house with their Mexican crew and become enamored of Mexico, the land of the people. Like their namesakes Maximillian and Carlotta long ago, they have idealistic dreams for their company and their new, adopted countrymen, their loyal workers. And like that ill-fated couple, they will be all the while comically ignorant of the forces that move against them, business rivals, bureaucrats and most fiercesome of all, a religious scourge, a Hindu swami intent on divine retribution. Young Fonzo Suarez’ playground of enterprise is a little lakeside village in the highlands of Jalisco, Mexico, beside the beautiful but suffering Lake Chapala. There some thousands of dark-skinned natives have lived for centuries, and there also nowadays many thousands of Americans and Canadians have settled among them to enjoy a serene retirement. Happily, these gringos have come with lots of money, thus providing a prosperous industry in which chubby Fonzo may always be there for the next opportunity. He always seems to find a next one. He may seem a bumbling, absurdly dressed fool, but his inner resources are formidable. Years living in Los Angeles have made his English perfect; his family in the village is of the oldest, wealthy and influential; and he has not a least scruple to inhibit him in any of his pursuits. It will work against him only that he can suddenly, in careless moments, become sentimental, a true fool for love.